August Tuggle is a sophomore studying vocal performance and psychology. August Tuggle has been singing for as long as she can remember. Her family has numerous home videos of the Evanston, Indiana native singing in her living room at the early age of 2; by the third grade, she had entered her first talent show. 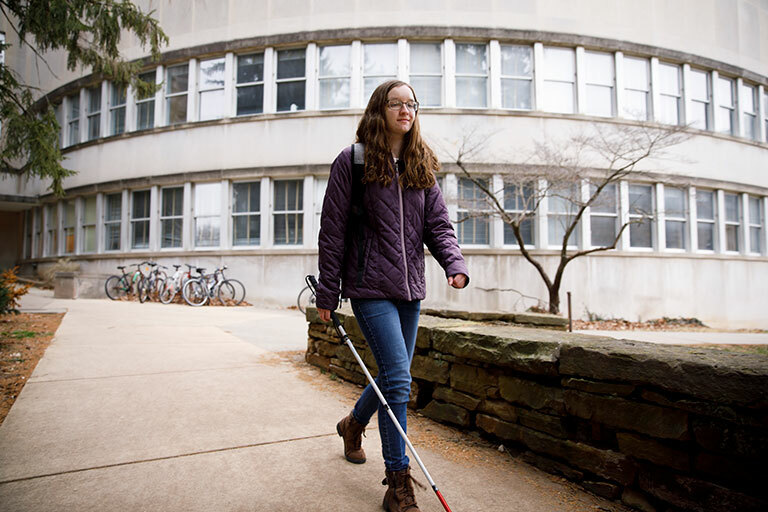 Although the Indiana University Bloomington sophomore is legally blind -- she has no vision in her left eye and very limited vision in her right -- that hasn't stopped her from pursuing her love of music and performance. In fact, it helped push her toward it. "Being born legally blind, I grew up as a very auditory learner and had trouble picking up on visual social clues," she said. "So music really appealed to me and became a way for me to express myself." After participating in school plays and choir groups throughout her elementary and high school career, Tuggle decided to dedicate her life to music and ended up getting into the prestigious IU Jacobs School of Music, studying vocal performance. But her road to IU wasn't easy. At first, Tuggle was set on studying music therapy, not vocal performance. She also was intimidated by the size of the IU Bloomington, worried about navigating the campus with a visual impairment. But as she had done numerous times in her past, Tuggle decided to face her fears head on. She applied and was accepted to Jacobs, and she hasn't looked back. 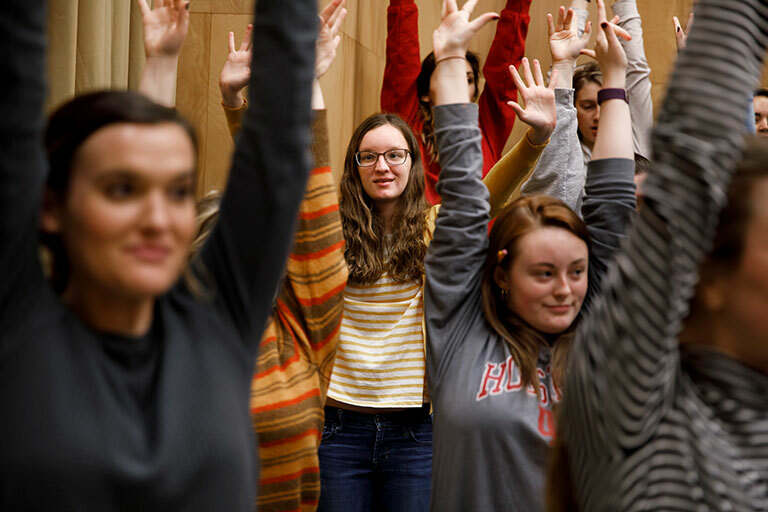 In addition to joining one of the most prestigious music schools in the country, Tuggle is also a member of the school's musical group the Singing Hoosiers. The choreographed, Grammy-nominated group has spent decades singing contemporary, jazz and Broadway hits throughout the world. Tuggle joined the jazz group within Singing Hoosiers to gain more vocal experience. She said she has enjoyed seeing herself grow vocally and becoming a stronger performer. "Being onstage means so much to me," she said. "In my experiences, music can connect with anyone in some way, and I love that feeling of connection with an audience or ensemble members. Like many people, I often feel awkward and unsure of myself, and singing has provided me an outlet, a way to contribute to the creation of something beautiful, which helps me feel more confident and gives me a powerful way to communicate with others. Everywhere I have gone, I have always found a home through music and performance. I couldn't imagine my life without it." Singing Hoosiers director Chris Albanese has witnessed that growth and the contribution Tuggle brings to the group. "August's skill set is rather unique in that she is both an outstanding soloist and flexible ensemble performer," Albanese said. "Her positivity and wit are qualities which contribute to the overall health of the Singing Hoosiers' organizational culture. August embodies the best of what a Singing Hoosier and IU student can be. We are truly fortunate to have her with us." When she is not performing, Tuggle is working as treasurer of Classical Connections, an organization within the Jacobs School of Music that brings music to underserved areas of the Bloomington community. After completing her degree, Tuggle, who is double majoring in psychology, plans to attend graduate school for music therapy or social work. No matter which career path she chooses, Tuggle said music will always be part of her life. So will advocating for people with disabilities -- not only educating others on the topic but encouraging those with disabilities to face their fears, just like she did two years ago. "My experiences here have taught me that I am capable of more than I thought," she said. "Just two years ago, this campus terrified me, but now I navigate it every day. Because of this, I am now looking at graduate schools further away from home in larger cities. The wonderful education I have received here has helped me grow in so many ways. IU has made me feel like I can accept any challenge." This Thursday, Jan. 24, join us as we follow August Tuggle through her day as an IU student as part of our One Day/One Hoosier series. Look for her story through @IUBloomington on Twitter, @iubloomington on Instagram and iu_bloomington on Snapchat as it happens live starting around 8 a.m. EST.